Lore City Airport, as depicted on the November 1950 Cleveland Sectional Chart. as it was not yet depicted on the 1947 Cleveland Sectional Chart. 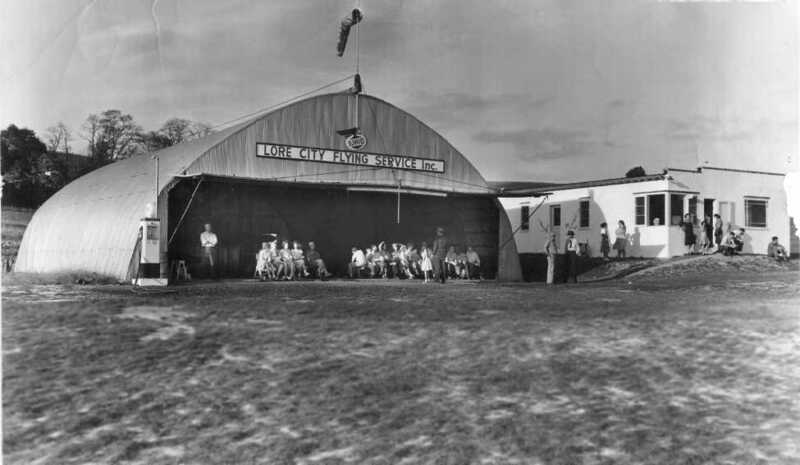 when pilots were trained from the hangar & landing strip on the property. The earliest depiction of the Lore City Airport which has been located was on the November 1950 Cleveland Sectional Chart. It depicted Lore City Airport as having a 2,000' unpaved runway. 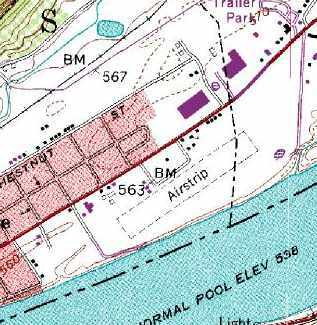 Lore City Airport was not depicted at all on the 1956 USGS topo map. with the airport office to the right. "My grandfather used to own an airport outside of Lore City. 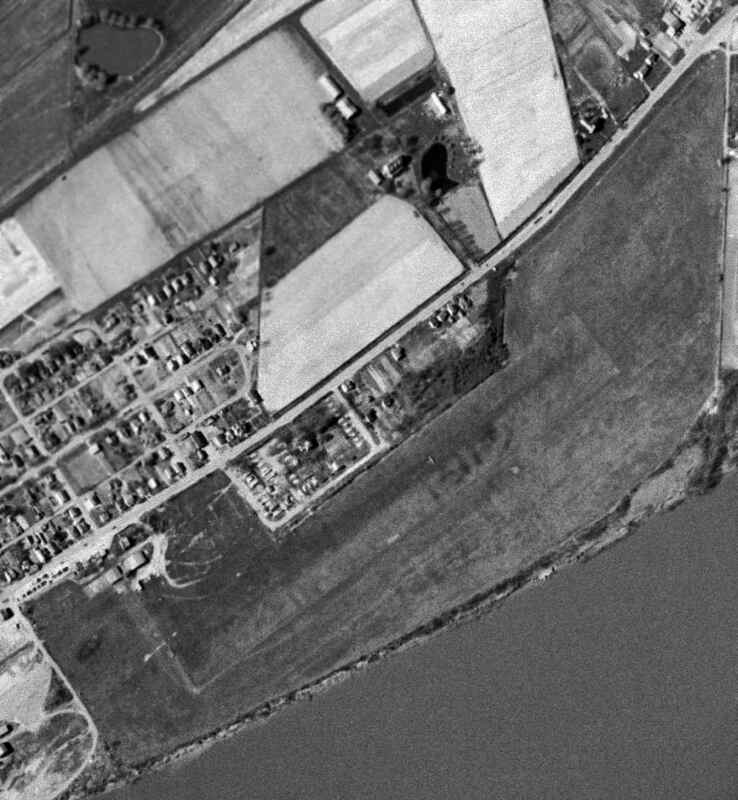 A 4/19/60 USGS aerial photo depicted Lore City Airport as having a hangar at the northeast corner of a northeast/southwest grass runway. The last depiction which has been located of the Lore City Airport was on the May 1968 Cleveland Sectional Chart. It depicted Lore City as a private airfield having a mere 1,800' unpaved runway. as it was no longer depicted on the My 1970 Cleveland Sectional Chart. "The hangar has been torn down. The FBO building is now a restaurant/bar." 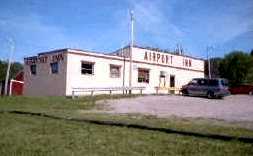 At some point the former airport office was reused as a restaurant, the Airport Inn. The Airport Inn has been owned by Donald & Elizabeth Duchè since 1993.
and replaced with a peaked-roof pavilion/shed, used by the restaurant. A circa 2005-2011 photo looking west at the Airport Inn, the former Lore City Airport office. A circa 2005-2011 photo looking northwest at the Airport Inn, the former Lore City Airport office. and the office building at the northeast corner remained standing. 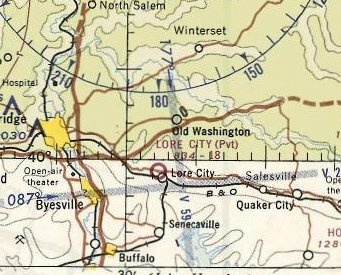 The site of the Lore City Airport is located northwest of the intersection of Route 285 & Wintergreen Road. Thanks to Ken Lane for pointing out this airifeld. as there were a large number of planes parked on the left side of the picture, along with hundreds of cars. The date of construction of the Twin City airport has not been determined. It described Twin City as a municipal airport, having 2 sod runways: 4,000' northeast/southwest & 2,000' north/south. It described the field as having 3 sod runways. 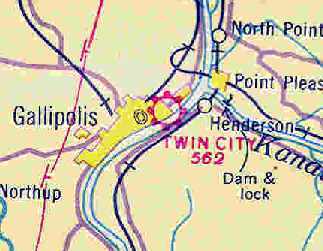 depicted Twin City as a commercial or municipal airport. described Twin City as having 2 sod runways: 3,000' northeast/southwest & 1,200' northwest/southeast. depicted Twin Cities Airport as an irregularly-shaped grass field. as a 93 acre L-shaped property having 2 sod runways, measuring 3,000' ENE/WSW & 1,200' north/south. to be owned by private interests, but not to be currently in operation. described "Twin Cities Airport" as a "Class 2" facility, owned by Dr. C. E. Holzer. According to Mark Phillips, airport owner Dr. C. E. Holzer was a prominent area physician. 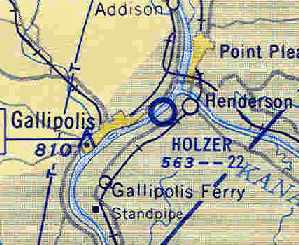 as it was labeled as "Holzer" Airport on the July 1954 Huntington Sectional Chart (courtesy of Chris Kennedy). 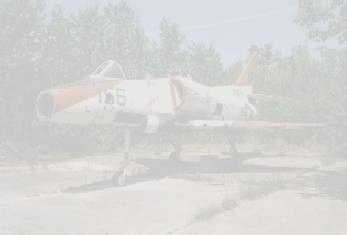 It was depicted as having a 2,200' unpaved runway. and a few small hangars on the west side. depicted Holzer Airport as having a 2,200 unpaved runway. 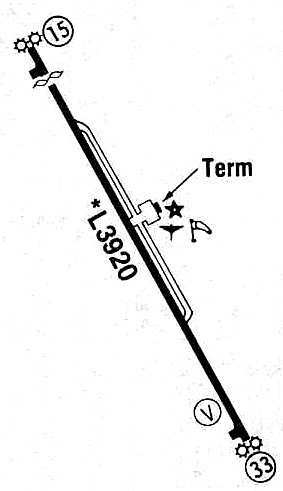 The 1960 USGS topo map depicted Holzer Airport's single grass runway, labeled simply as "Airstrip". A 1967 USGS topo map depicted 3 single-engine aircraft parked next to a T-hangar. just across Route 7 to the north, which boasted a paved runway. The precise date of closure of Holzer Airport has not been determined. 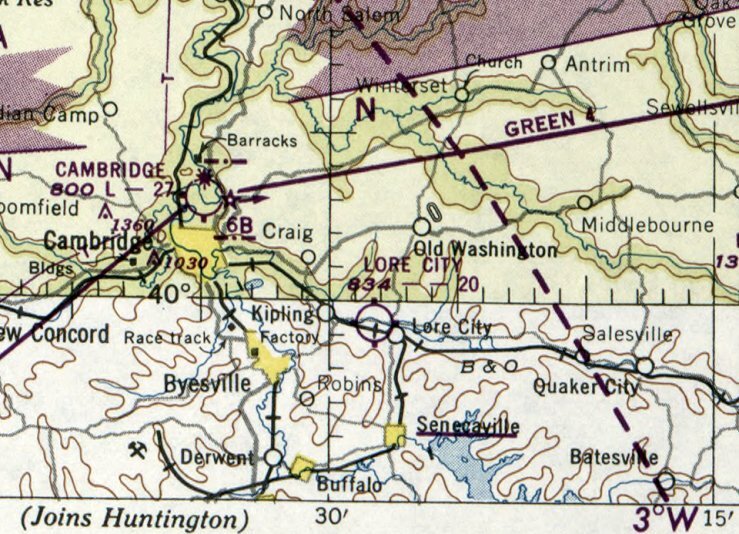 The 1975 USGS topo map still depicted Holzer Airport's single grass runway, labeled simply as "Airstrip". 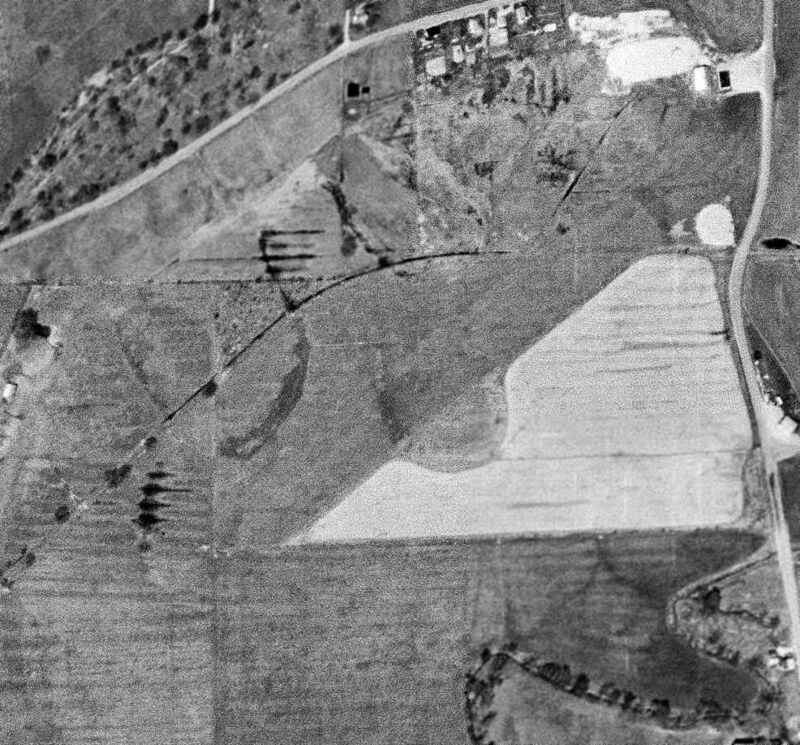 A 1988 USGS aerial view looking north showed the site of Holzer Airport was remarkably undisturbed. It is unknown if any of the buildings surrounding the field date from its airport days. the creature for which there was a movie released in 2002, starring Richard Gere & Laura Linney. According to old press clippings, a few men were awaiting a friend's landing. 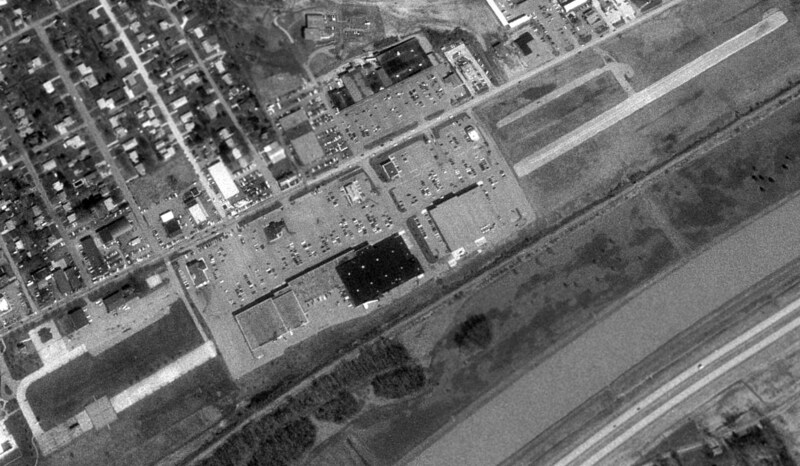 A 2015 aerial view looking north showed the site of Holzer Airport to be completely redeveloped, erasing any trace of the airport. A postmark commemorating the 9/23/34 Athens Municipal Airport Dedication. 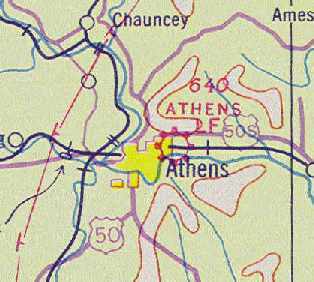 The first airfield in Athens was located on East State Street. Athens Municipal Airport was dedicated on 9/23/34, as commemorated on a postmark. which was described as having "Athens" painted on the roof. 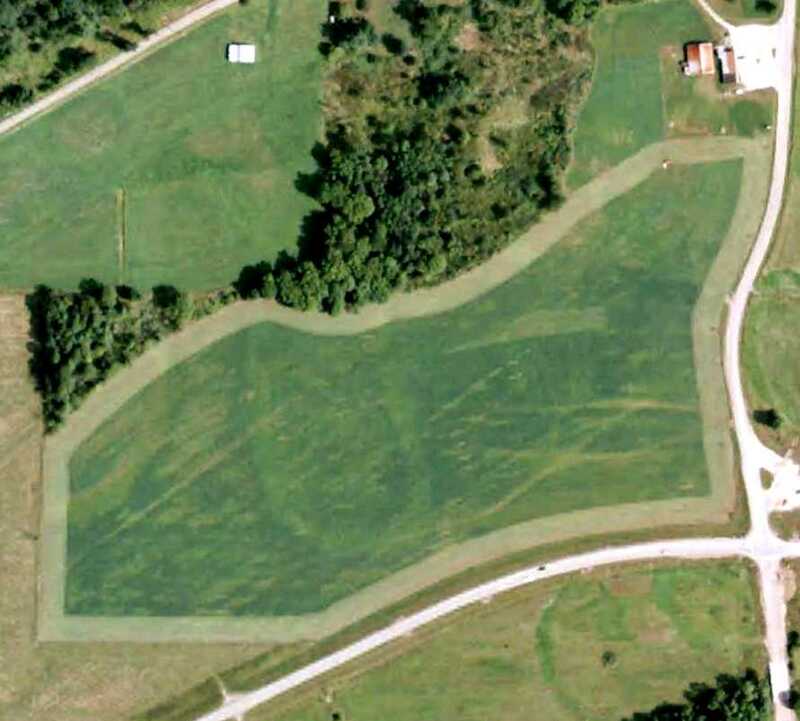 The directory described Athens Municipal Airport as having a 2,300' x 600' sod landing area. was on the June 1939 Huntington Sectional Chart (courtesy of Chris Kennedy). showing several hangars & a control tower. The airport was owned by the Rowland Family until 1943, when Ohio University purchased it. 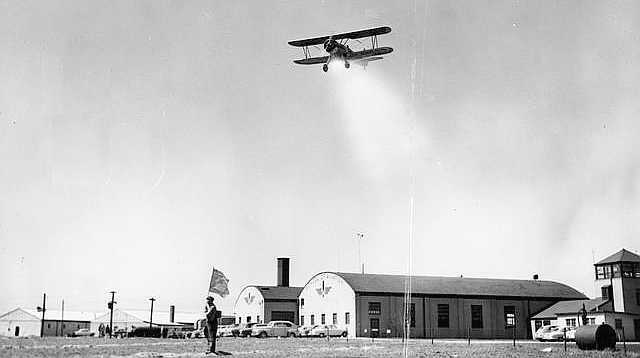 The airfield was initially used for the Civilian Air Patrol & eventually for the University's aviation training program. depicted OH University Airport as having a single east/west runway. it was labeled "Ohio University". as a 62 acre irregularly-shaped property having a single 4,000' east/west sod runway. and to be owned & operated by Ohio University. A 5/12/46 advertisement for flight training at Ohio University Airport (courtesy of Mark Hess). 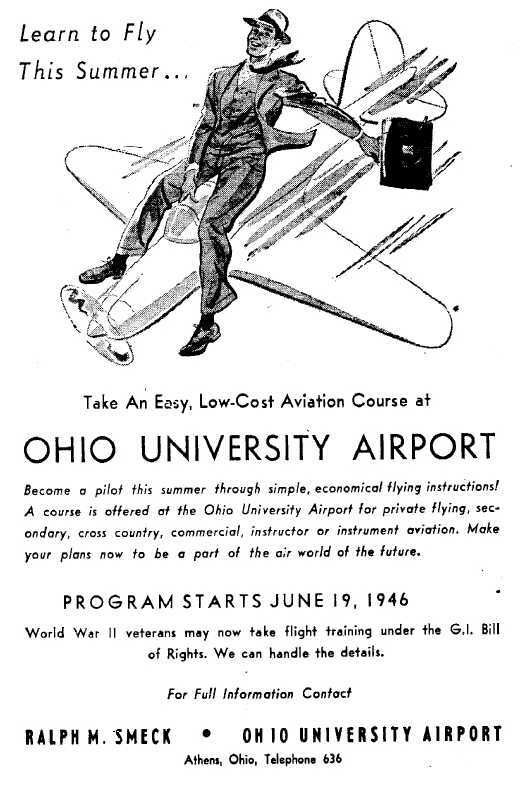 A 5/14/46 advertisement for flight training at Ohio University Airport (courtesy of Mark Hess). 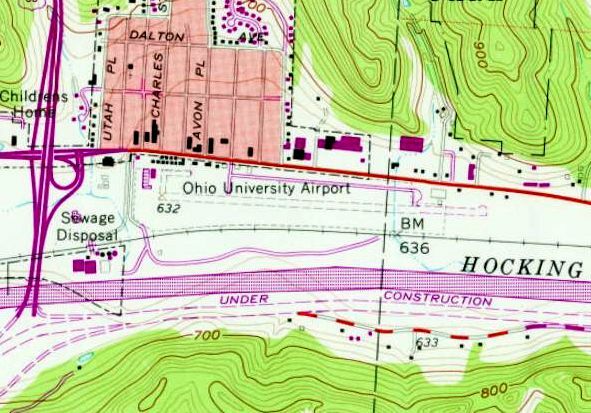 Ohio University Airport as depicted on the 1947 USGS topo map. 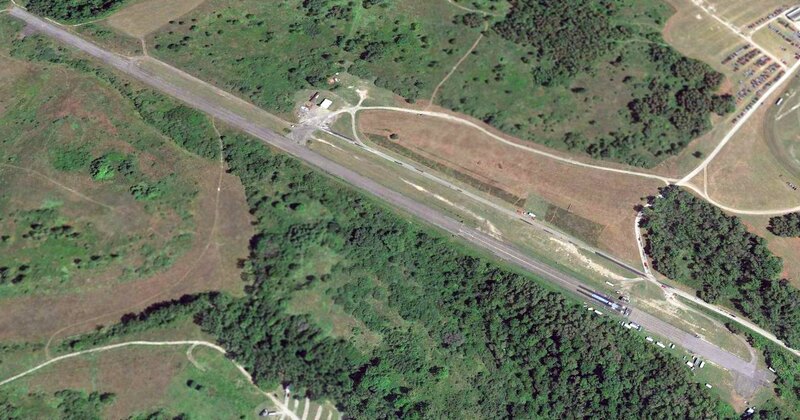 Ohio University Airport had a 4,000' unpaved runway. 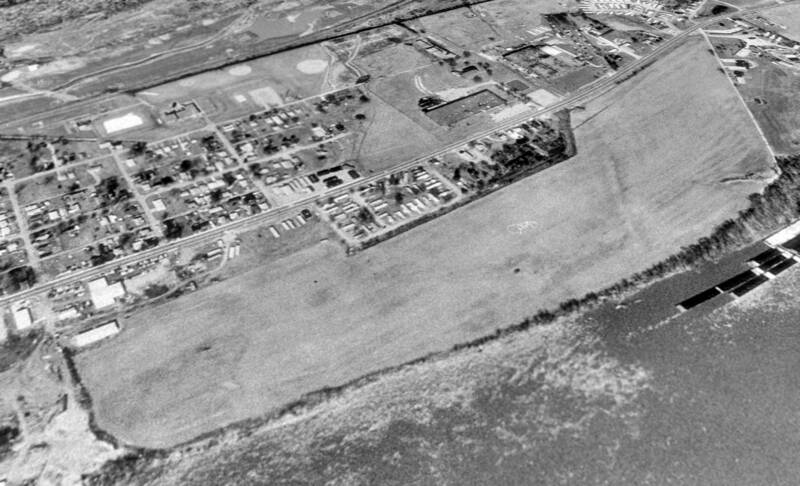 The last photo which has been located of the original Ohio University Airport was a 4/23/60 aerial photo. It depicted the field as having a single paved east/west runway,with several small hangars & 5 light aircraft on the northwest side. the Ohio University Airport was described as having a single 3,200' concrete Runway 9/27. The operator was listed as Ohio University. The layout of the Ohio University Airport, as depicted on the 1966 OH Airport Directory (courtesy of Chris Kennedy). on the opposite (south) side of the Hocking River! 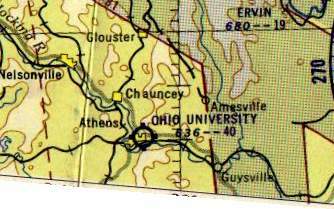 The Ohio University Airport was still depicted on the 1967 Huntington Sectional Chart (according to Chris Kennedy). the University was forced to find another location for its airfield. After exploring nine sites, Albany was selected as the site of the new Gordon Bush Regional Airport. The original airport in Athens presumably closed when the new airport opened (in the 1970s?). as only the new airport was listed in the 1972 Flight Guide (according to Chris Kennedy). 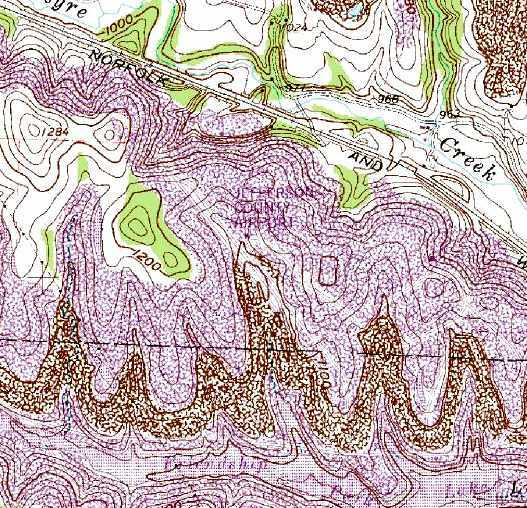 it was still depicted on the 1975 USGS topo map. 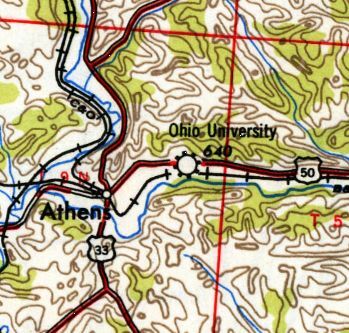 A 1994 USGS aerial view looking northeast showed the site of the original Ohio University Airport had become the Athens Mall Shopping Center. 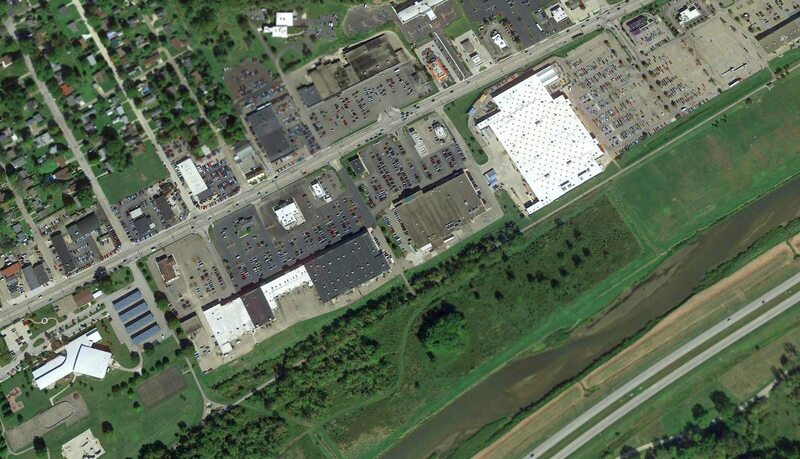 The center portion of the former runway had become the site of a Kroger & Ames stores, and their parking lots covered a large portion of the former airport. However, significant portions of the former runway & taxiway still extended outward on both the western & eastern end, reaching a total runway length of 4,000'. Several former hangars still stood on the former ramp area, north of the western end of the runway. Brian Pralgo recalled, "From 1996-97 I lived across the street from the old airfield. I remember seeing people use their radio-controlled cars & planes there. Also, student drivers practicing their parking skills." Jason Hitesman reported that "The old airfield is still used for driver training & by locals as a place to run RC cars & planes. Some of the old hangars are now used as county support buildings & there is a farmers market that is held in some of them. but had never noticed that there were still remains of the runway to the west as well as the old airport buildings. The southwest corner of the old runway I had actually visited but never realized it was a runway. The extreme western edge is now basketball courts and just east of that is a set of handball courts. probably were why the school abandoned the field and built a new one some miles south of town along Route 33." Brian Pralgo reported in 2004, "I believe that the remaining remnants of the old runway are now gone. Walmart came to town. At the very least, the part that is east of the Kroger shopping center is gone." Steve Perry reported in 2007, “The field is now entirely gone. The east end has been developed by Walmart, Lowes, etc and the west end is now a community center, pool, tennis courts, and green space. A 2015 aerial view looking northeast showed no trace remaining of the original Ohio University Airport. The site of the original Ohio University Airport is located south of East State Street, east of Route 33. 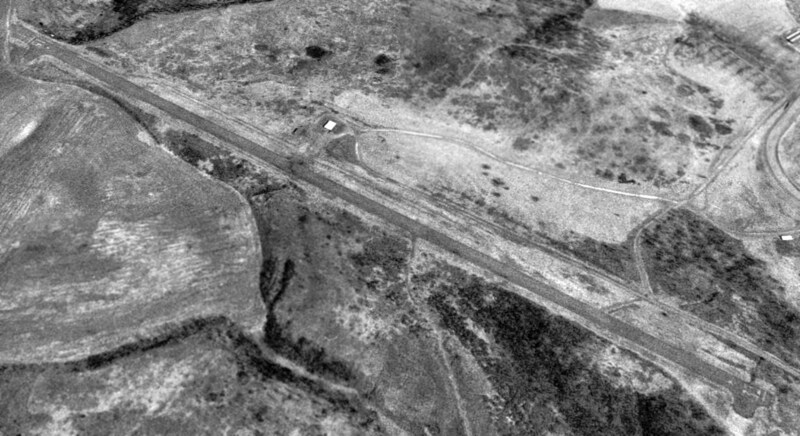 The original Jefferson County Airport, as depicted on a 5/11/72 USGS aerial photo. nor depicted on the November 1972 Detroit Sectional Chart (courtesy of Richard Finley). which may have been a drag strip or a runway. The 1973 USGS topo map depicted a northwest/southeast feature labeled “drag strip”. 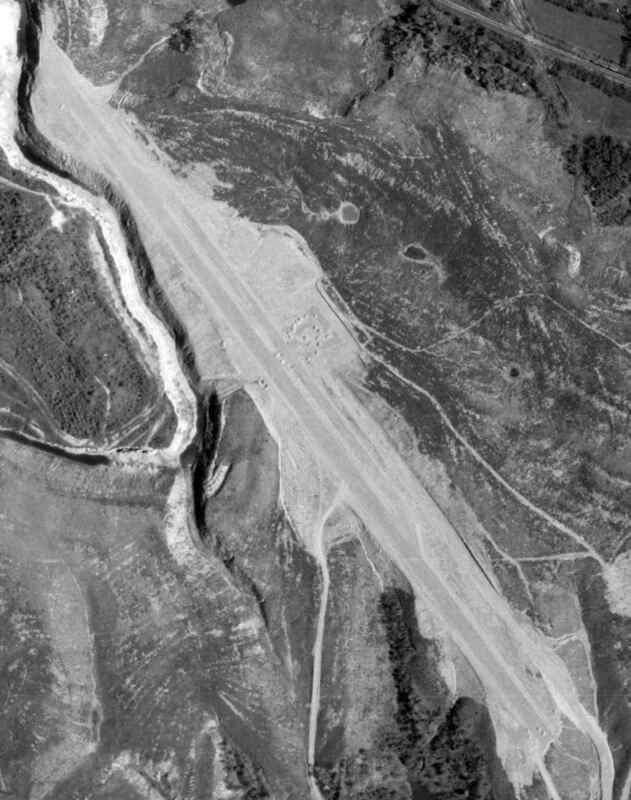 which depicted it as having a single 3,500' paved runway. The airport was reportedly located on a former coal mine. David Straka recalled, “I learned to fly there back in the late 1970s. There was a flying club located there. One of the members was Bill Ralston. He & his entire family and a friend were killed in Colorado when one of the club's plane crashed out there. 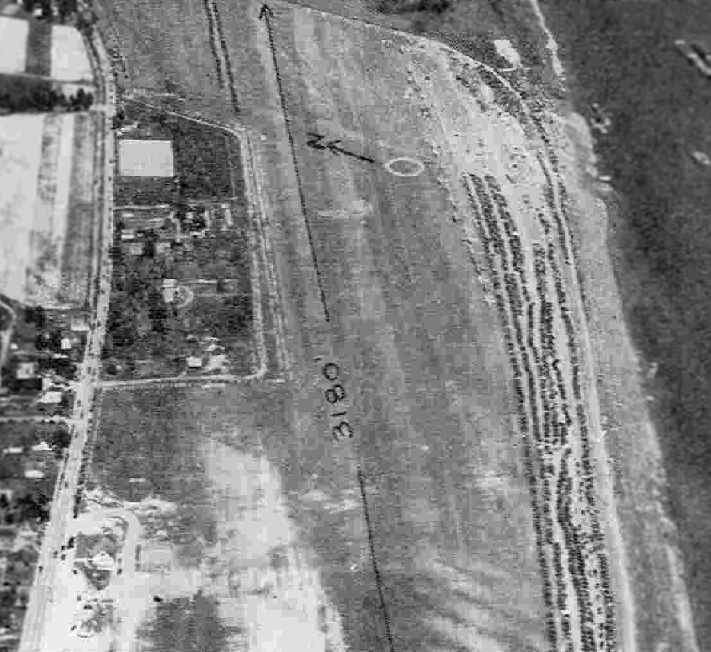 The white building in the center [of the field] was kind of a flight office or Fixed Base Operator's office. They never did have hangars out there. labeled “Jefferson Co Landing Strip”. 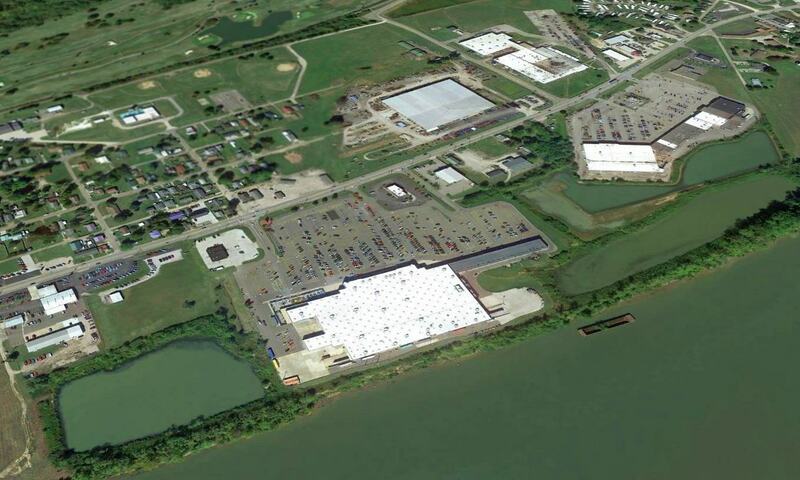 which described the Jefferson County Airport as having a single 3,500' asphalt Runway 15/33. The 1984 USGS topo map depicted a single northwest/southeast runway, but did not label the site at all. leading to a small ramp with a single small "terminal" building. It did not depict any hangars. as that is how it was labeled on the October 1990 Detroit Sectional Chart (courtesy of Richard Finley). The name of Jefferson County Airport had evidently been transferred to the former Steubenville-Pier Airport as few miles to the northeast. being about 20 miles from county’s largest city, Steubenville. and county couldn’t afford to have full-time security. and the former airport office building (the white building) north of the runway midpoint. 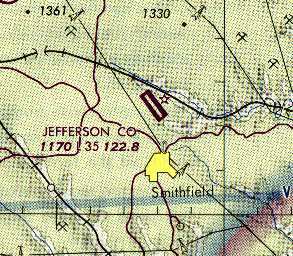 The legend “Jefferson County Airport” was barely visible on 1995 USGS topo map. was reused for drag racing, as the Friendship Park Raceway. 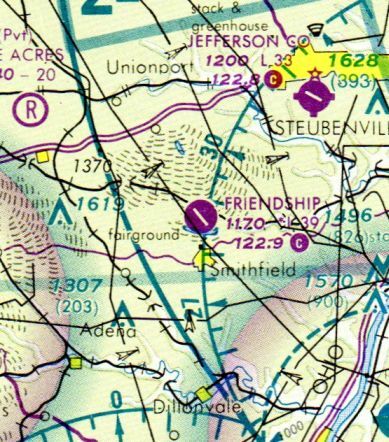 Friendship Airpark was depicted as an abandoned airfield on the March 1999 Pittsburgh Terminal Aeronautical Chart (courtesy of Ron Plante). It was also formerly known as "Steel Valley Dragway". The “1/8 mile asphalt drag strip” was listed as being for sale in 2005. As of 2011-2014, the site was labeled “Friendship Airpark” on street maps. showing the portion in the foreground which was reused as a drag strip. of Friendship Park Road & Township Highway 191. Thanks to Funneman1 for pointing out this airfield.